Digital Panel Meter consists of a numeric LED/LCD display and an A/D converter that indicates measured analog values or monitoring analog output signals, such as voltage, current, pulse and etc. A digital panel meter can be connected to a printer, recorder, BCD indicator or a computer where the transferred data will be further analysed or used online. As a digital instrument, they are highly accurate and reliable for a wide range of applications. 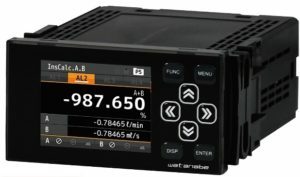 Bestech Australia offers a full range of versatile digital panel meters providing variable indication apart from DC/AC voltage and current, for instance, displays of frequency, temperature, pressure, volume, resistance, and other measuring or monitoring parameters or devices like thermocouple, RTD, Strain Gauge and etc. Measurement speede Fast measuring rate up to 4000Hz, or normal reading mode on the object being measured. It is necessary to select the type of DPM according to the purpose of use. On the left is the A/D transfer display circuit, input (Ex) is connected for a fixed period of time (Ts) and is integrated when S1 turns ON. Now, when S2 is ON, the reference voltage Es of a reversed polarity from Ex is connected, and is integrated towards the zero voltage direction. 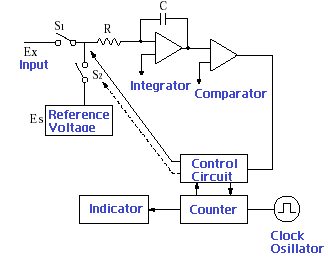 When the integrated output becomes zero, a comparator will activate and the integration will be stopped. The time brings it back to zero is Tx. A formula is established as the relationship of those periods as blow. As Es and Ts are predetermined values, a digital value proportional to the input can be acquired by measuring Tx with a pulse counter. 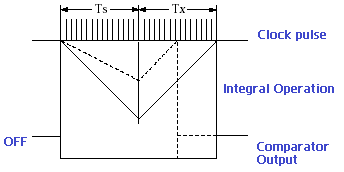 In the integral method to the left, the + half cycle and the – half cycle offset the superimposed noise effectively. Therefore, when the input integral time is more than doubled of the power supply frequency, an infinite noise rejection ratio can be achieved theoretically. When a filter is inserted into the input circuit, a larger NMR (normal mode rejection) can be acquired for that portion. CMR (Common Mode Rejection Ratio) is the percentage of error that is generated under actual operating conditions, where the common mode voltage (phase noise) that equals to the common point (Ground) affects the input terminal as well as the measurement. 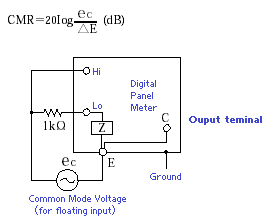 There is a ground difference between the ground terminals of the signal source and the DPM. 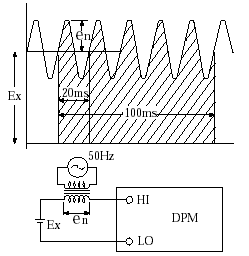 This noise appears between the Hi-Lo input terminals of the measurement and is caused by the flow of the ground current. The phase noise becomes larger along with increase of distance between the two grounding points, and a noise voltage may be from several volts to tens of volts. Below is a definition of Common Mode Rejection Ratio Assuming. Output voltage changed (?E) When applies the common mode voltage eC (peak AC voltage) to the circuit. Due to its wide range of applications, there are many types of digital panel meter (DPM) to be selected to suite the purpose of usage. Precision and high accurate measurement values can be achieved by the digital panel meters, and eliminate human errors. Bestech Australia supplies a comprehensive product lines in the digital measuring instruments, including counters, tachometers and temperature meters, as well as displaying indicators for voltage current measurement, which leads to a wide range of applications. The entire series of digital panel meters was designed with high reliability, possessed most advanced A/D technology, and tested under the strictest quality control. In addition, aging tests and QA inspections are also performed based on the national standards and a traceable standard management system to ensure our customers receive the best possible products and service. For more details, please CONTACT US with your application details. Please complete the enquiry form below for specific information and advice on Digital Panel Meters.